Just downloaded it a few minutes ago. So far so good. I was just going to say the same thing. Nice to see them getting it out during the current month. Lets hope that continues. Same here! Good jump start for updates! Lol. Yeah it is and I hope so to but won't be shocked if they get behind again lol. I had dozed off and woke up with the notification of the update. On the note8 I had to go to settings to search for update lol. I get this when I search for updates? Wth? Nothing on the unlocked version. Sigh. Yeah, frustrating ... I actually got some type of update the other day on my unlocked variant, but it's still on August 1 security patch. I'm on att still on July. other att note 9's have gotten the update. Thanks but that's the Android version. It typically stays the same for months at a time, through several firmware updates. The firmware is listed as "Baseband version". That's what identifies each firmware update you get. The last four characters suffice to identify the firmware for a given model. Jewels81 and Gary02468 like this. I've been delaying it since yesterday because I have to temporarily re-enable everything I have disabled first (I use Package Disabler Pro). 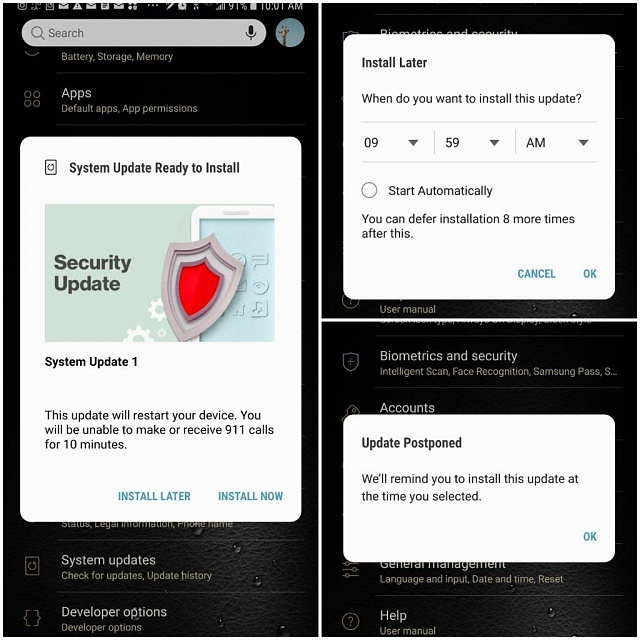 Seems they're a lot more pushy with updates now - I'm STILL delaying the Oreo update on my Note 8! Oh cool since you got the phone yesturday it was already set to September 1st then. Maybe that is why you got that alert/message. Not sure tho. If it happens again around the next time a update comes out I would try talking to Verizon. Sorry wasn't much help. Yay update all the things! . Jewels81 and shaimere like this. I have the same issue since last night. My husband got his update on his. So when I went to check if mine is available I got this message. I was forced to factory reset my galaxy s7 after a system update and lost all my photos and data. Will the Mate 10 PRO GPU Turbo update reach All Markets?